Savings - How Do You Compare? We often hear that saving money is a challenge. A recent survey shows that nearly 50% of Americans can’t come up with $400 in an emergency without using a credit card. Since 2015, GoBankingRates has conducted a survey of 5,000 Americans to see how much they have in a savings account. This year's results show that people are having a hard time saving. While saving money isn't a competition, and everyone's needs are different, it can still be useful to see how you compare to others. 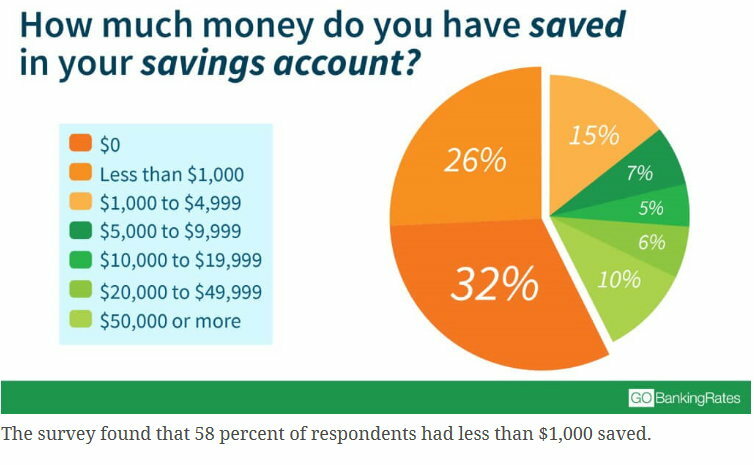 While the percentage of those with nothing in savings has dropped, nearly a third of respondents still have no savings. We all know it's important (and hard) to save money. The easiest way to save money is to pay yourself first. This means putting money in some sort of savings account before you have access to it. That can mean having your employer deduct money (i.e. for a 401k) before issuing your pay, or sitting up direct deposit so that a specific amount goes into an inconvenient to reach savings account and the rest into your checking account. If you're having a hard time saving money, don't forget there are many helpful free resources, including bankers and financial advisors. While discussing your budget is never the most comfortable topic, you shouldn't let that prevent you from seeing a financial advisor. It's a judgement-free zone and the guidance you receive can be priceless. You can get started by scheduling an appointment with a Personal Banker or visiting any of our banking centers. We'll be happy to help you with a financial review, with absolutely no cost or strings attached. Discover how one of our Personal Bankers can help you put a budget together that works for you.